Not much, frankly. Very little, in fact. Not quite nothing, but close. The only noticeable change to the house is a temporary power pole in the backyard that doesn’t have power yet. And the Bermuda grass taking over the backyard because nothing is in the way. And the basil keeps growing and reseeding. I bet we have basil in the grass for years. And the slowly drying up plants because there’s been no rain and the water to the lot is shut off and we don’t have power to run the sprinkler anyway. Though the opening was a bit of a lie. 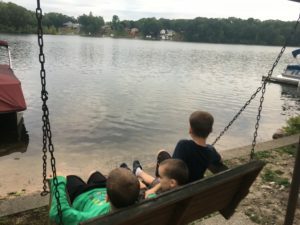 We went to Denton for a wedding, lounged at the lake house in Oklahoma, saw dear friends in Chicago, spent 10 days in Michigan working hard to do nothing, and celebrated a family wedding with cousins meeting and playing together. Now I’m spending a week with some wonderful teachers doing writing, and I ended up on four different AERA proposals. So there. We also fired our first contractor, hired a second, reviewed estimates, moved into a condo, and got our dog back. When I tell people that nothing’s been done on the house in six months, many of them ask “So, what’s the deal? 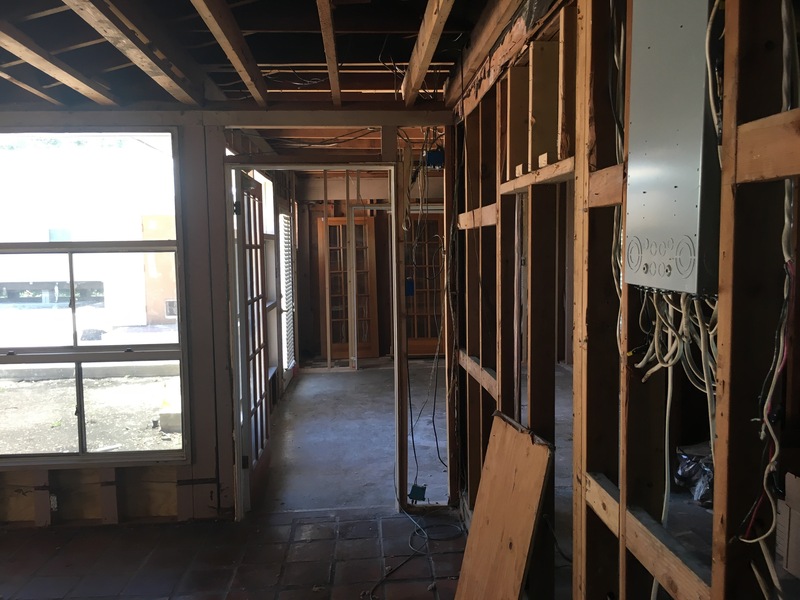 Why was your contractor not doing anything?” My answer is: “I don’t know and I don’t care, I just know I don’t have a house yet.” I came to that answer because through all of this, the serenity prayer really has been my mantra. And, one thing I cannot change is what caused my first contractor to not do his job. The wisdom is knowing it doesn’t matter and not dwelling on it and moving on. I certainly found myself wanting to know what the deal was, but it doesn’t matter. Whatever is happening with that company is something I cannot change, and it isn’t my place to change. A more irreverent version might be “Not my circus, not my monkeys.” So, we moved on. The one story worth telling in all this is that our first contract said that we needed to replace all of our waste water plumbing. For those unfamiliar with the world of slab construction, that would mean jackhammering the concrete slab foundation, pulling out the old cast iron pipe, replacing it, then pouring new concrete back on top. Now, we’ve got a solid foundation, which is a rarity–no cracks, now shifting. And the waste water runs across the house, essentially bisecting the bedrooms, and then across the back of the house, joining the other drain outside the back door. The idea of jackhammering through it made me nervous: “Will it crack now?” “Can that new concrete really be as supportive?” “What if there’s a problem with replacement?” “How long will that take?” And the $28,500 price tag was, to say the least, not happening. So, we paid a different plumber to scope the pipes. His assessment was that all is fine, and in really good shape for being 65 years old. We hope to use that company for the replace on the house because they’ve been honest and efficient! So, woo for not needing to replace the waste water plumbing and spend $28k we don’t have! As always, generally things are good. Our new condo has a pool, which is great for August in San Antonio. I bought long-sleeved rash guards for the boys knowing how much they’ll be in it. It’s wonderful to have our sweet puppy back with us, though she her adoptive parents miss her. And our time in Michigan was too short, though it was so wonderful to bookend our trip with the happy, wonderful joy of weddings. Onward, always. May 31st. That was our 100 days. Since our house burned down my husband and I have both turned 40 and celebrated our 10th wedding anniversary. 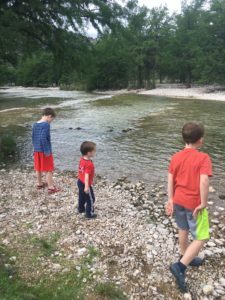 While our family trip to the Frio River over Memorial Day weekend was wonderful, I had inklings of cooking up something really wonderful for us– Then our house burned down. What makes passage of time real is, as always, the little things. 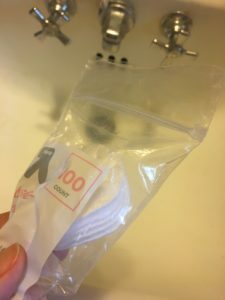 I’m about out of the cotton rounds that I use for my face stuff. The package held 100. The toothpaste is getting down there too. And the hand lotion. Replacing these things is a signal of how long we’ve been gone. We removed the 1970s era fridge from the kitchen when it started leaking rusty something down the back. And in moving the fridge from the tiny house into this house, we also moved the grill. That’s been wonderful as I use the grill as an oven through the summer. Even frozen pizza is pretty wonderful dressed up with some toppings and cooked on a pizza stone on the grill. Purchasing of the America’s Test Kitchen Cast Iron Skillet Cookbook has been a real boost for my grilling ego because German pancakes/Dutch babies, cheesy pizza dip, and shepherd’s pie. So that’s been good. And we’re probably moving again. Mentally I’m imagining us not home by Christmas and we can’t stay in this house for another 6 months. Something expensive is going to break and then I’d feel guilty. So we’re house/apartment/condo hunting, but thankfully there’s a company that does that work for us. Yes, we have a roof over our head, plumbing that works surprisingly well for how old it is, a lovely little backyard with a great patio and trees– really, many things to be thankful for. And, I’m deeply grateful for the generous neighbor who offered the house before she was ready to rent it, and an insurance company that shows up and writes checks. But we’re not at home. We’re not in the space we had worked hard to try and make our own. We don’t have our things. And the things I wish I had are things like the wall of my grandfather’s sketches that I saw every time I walked down the hall, or the just-right casserole dish to make apple crisp for breakfast (it’s delicious and you should totally try it), or the marimba which my husband or youngest would play while we got dinner on the table. Or our dog, who has been spoiled to pieces at my cousins and is happy as all get-out, but isn’t with her family who misses her. But we go onward because that’s the choice before us, with the help of friends and family. And the kids are totally pulling for an apartment with a pool when we move. Or a house super-close to school. As the end of the semester blew by I was buried in many wonderful manuscripts and things. They were quite effective at distracting me from grading. Usually I enjoy grading final projects. I mean, I’ve designed all the final projects, so they’re things I’d be interested in reading (a lot about collecting different kinds of texts to read), but with the house and things, I was finding much less joy in said grading. So, I wrote a lot. An article about reading instruction that my colleague-friend Katrina Jansky and I wrote will hit the presses shortly in the summer edition of English in Texas. We developed this from our presentation at the Texas Council of Teachers of English Language Arts Annual Conference in January. Abstract: It’s an era of uncertainty: new TEKS, changes to STAAR, school finance… What’s a teacher to do? How can teachers avoid reinventing the reading curriculum every time a change rolls around? Reflecting on the foundations of reading instruction–time, choice, relevance, talk, and rituals and routines–offers a way to answer these challenging questions. This article connects each of these touchstones to theory and research, as well as discusses brief strategies that support each principle. The article also offers teacher commentary on each principle. Finally, the article argues that the heart of reading instruction doesn’t change, it is readers falling in love with books. For another manuscript, and building on our work about writing on the walls, Anna Consalvo and I finished up a manuscript about post-it notes. It’s under review, so send some happy thought bubbles in to the universe if you’ve some to spare. I also had the great privilege to present for a Heart of Texas Writing Project Saturday workshop focused on advocacy. I even wrote a blog about it and NCTE published it. While the rhetoric around education today is almost entirely economic–go to school to get a job. There is a long tradition of culture and citizenship being the driving force behind education. 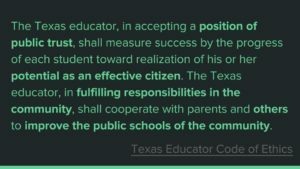 I think–as does the Texas Educator Code of Ethics–that it’s high time to return to that citizenship piece. There is also a long tradition of educators raising their voices to support students, schools, and public education. Now is also the time for such voices to be persistent. If you measure progress by the house, there’s very little. 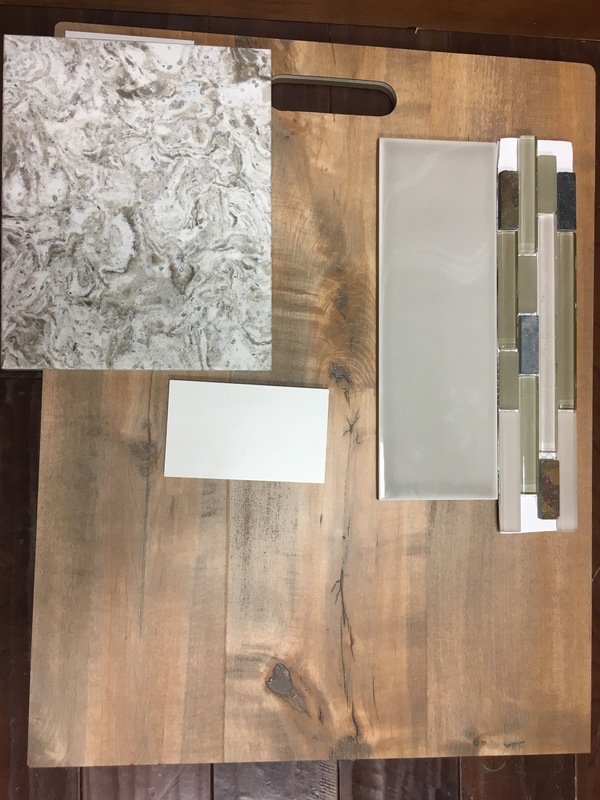 We did pick some finishes. So there’s that. But there’s no timeline for actually building the walls that would hold said finishes. We’d be happy with power at this point so the backyard stuff could move forward. Spring, though, continues to do its thing, no matter what we humans at getting in about. These are all backyard plants, 3 volunteers. 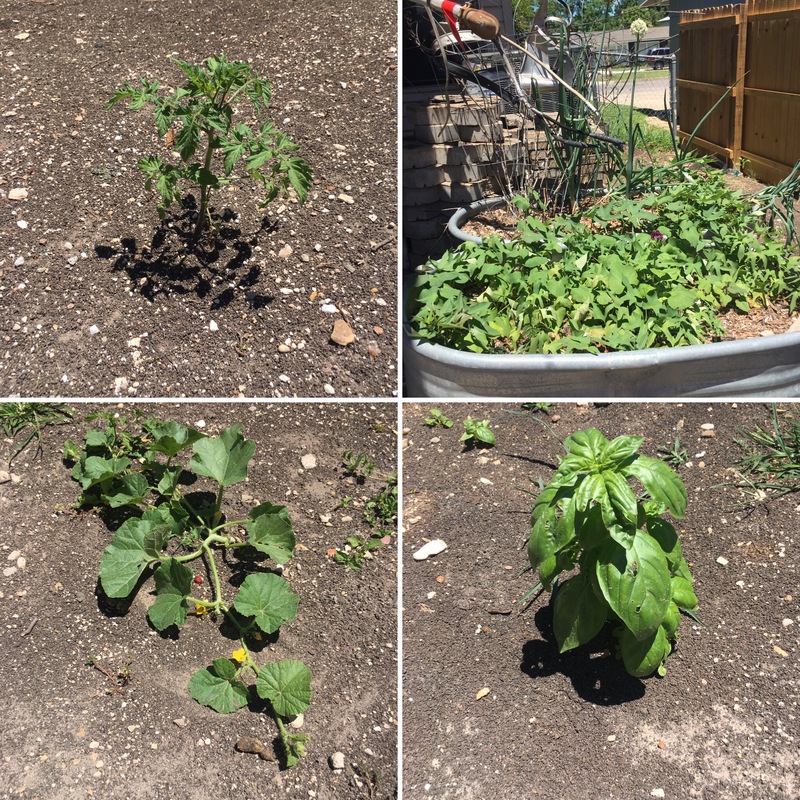 Tomato, sweet potatoes (those I planted last fall), squash, and basil. So at least we’ll have some veggies and herbs, no matter how long the house takes. All that said, I’m relishing my own moment of realization that the document I spent the better part of 3 years growing is proving its usefulness four years down the road. The specific impetus for this ah-ha is a section of my dissertation where I hash out the history of English as a discipline, drawing on largely on Applebee, Myers (pdf), and Smith, and specifically on Berlin (pdf) and Hillocks as they look at writing. This thinking is proving useful again as I revise and refine the keynote I gave at Old Dominion. Why do we teach the way we do? While there are all kinds of immediate and pressing reasons–state standards, principal’s mandates, student populations, budgetary constraints, etc.–there are also disciplinary histories. The teaching of writing sits on the intersection of all kinds of those histories: English, English language arts, composition, rhetoric, literacy. So the “Why do we teach writing the way we do?” is as much about testing culture as it is about the various paths that individuals have charted through these intersecting disciplinary boundaries and what they bring to a particular classroom, department, school, and district. And all the people who they work with, or have gone before them, who also have their own paths and ideas. So, it’s complicated. In this complication, though, I default to re-examining history. Answers can often be found there, and while it may be cliche, we should pay attention. For me, I also remember as a teacher having very little sense of this history. I just never learned the history of my discipline because, as a novice, I was more concerned with how I was going to occupy students for 45 minutes and, hopefully, teach them something. Now, as someone growing into the role of expert, I realize the value of knowing this history to that I can be strategic in how I respond to any given policy, mandate, or tone shift. And I take on this stance of looking to history and the past to remind myself where I was and the thinking that led me to the particular document that is my dissertation. It helps me ground my own thinking as I range here and there. Anyway, I’m enjoying my dissertation with all it’s wobbles and bumps. And I’m enjoying revising bits of it into new things.